Construction storage containers can save time and money for equipment-heavy construction companies that handle roofing, stonework, plumbing, masonry, electrical engineering, etc. Bringing heavy tools and machinery to a job site every day wastes time and gasoline, and therefore, money. Having everything on site during the entire project also extends the actual work time in the day, which helps your bottom line and schedule. Renting an on-site portable storage container for your work materials and equipment is an easy, effective solution. To make sure that renting a storage container is a smart choice for your construction site, you need to evaluate a few things. It’s the foreman or contractor’s responsibility to ensure that the correct equipment is available on site. When selecting construction site storage containers, three factors need to be evaluated – that it’s large enough to hold all of your equipment, that it’s safe and secure, and that it’s weather resistant. A.B. 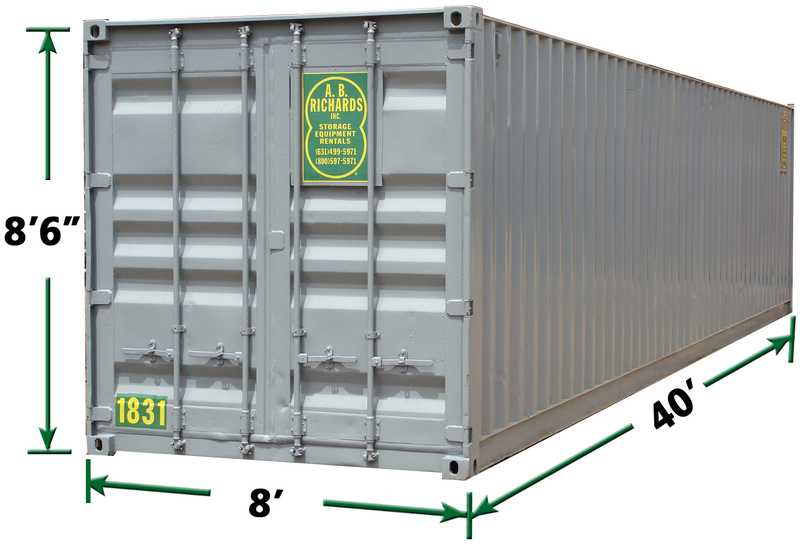 Richards has three storage container sizes – 20ft, 40ft, and 40ft jumbo. The graphics below detail the size specifics for the storage containers so you can calculate which is right for your heavy machinery, engineering equipment, heavy trucks, construction equipment, heavy hydraulics, heavy vehicles, etc. A.B. Richards’ storage containers are built strong, so you can be sure your expensive construction equipment will be safe. Made of 14-Gauge Steel, they come with a heavy-duty exterior lock. We also recommend using lights to keep your construction site illuminated to ward off vandals, trespassers, and thieves in general. Because A.B. Richards’ construction site containers are made of steel, they’re sturdy and weather resistant. So long as you lock it securely, you can be confident that your equipment will be safe from thunderstorms, hurricanes, blizzards or heat waves. Our steel storage containers for construction sites are even fire resistant. With job site storage containers, your workday can start as soon as you arrive because you don’t have to go to your headquarters to get your equipment and tools. That time saved every day adds up, possibly enabling you to finish the job faster. Eliminating daily drives back and forth to your equipment storage facility also saves you money on gasoline. By having all of your equipment and tools on site, you’ve also lowered the risk of injuries related to lifting heavy machinery on and off trucks because it’s all right there. Construction site storage containers can be used for more than equipment. You can also use them to keep all of your building supplies, such as paint, drywall, shingles, lumber, glass and windows, steel and wood beams, cement blocks, and more, locked yet accessible on-site in one of our storage units. Having everything on site and available, you can improve workflow for your construction job. You can even equip our storage containers with shelving, tool racks, storage cabinets, etc. to keep things organized and efficient. Statistics from the National Insurance Crime Bureau (NICB) and the FBI show an increase in theft of copper and brass material at construction sites since 2012. A.B. Richards storage containers can help thwart theft, saving you money and time to replace them. Learn more about how one of our storage containers can keep your copper building material and supplies safe by reading our blog post on the subject. Why Choose A.B. Richards for Construction Storage Containers? You’ve decided that a construction site container is the perfect solution for your next building project. Now let’s address why you should choose A.B. Richards for that storage unit. Convenience is the first reason. A.B. Richards delivers our storage containers directly to your site. Whether your project is in New York, New Jersey, Pennsylvania, Connecticut, Western Massachusetts, Rhode Island or Delaware, our storage container experts will bring the storage unit to whatever location you need. Second, A.B. Richards’ storage containers are bigger and more affordable than the competition. PODs largest container is smaller than our smallest container. If you break down the price per square foot of those two models, A.B. Richards is a fraction of the price of PODs. Why pay more for less space? For more information about comparing A.B. Richards to PODs, see our comparison chart. A.B. Richards has been in the storage container industry for more than 30 years. We have the knowledge and team you need for a great rental experience. 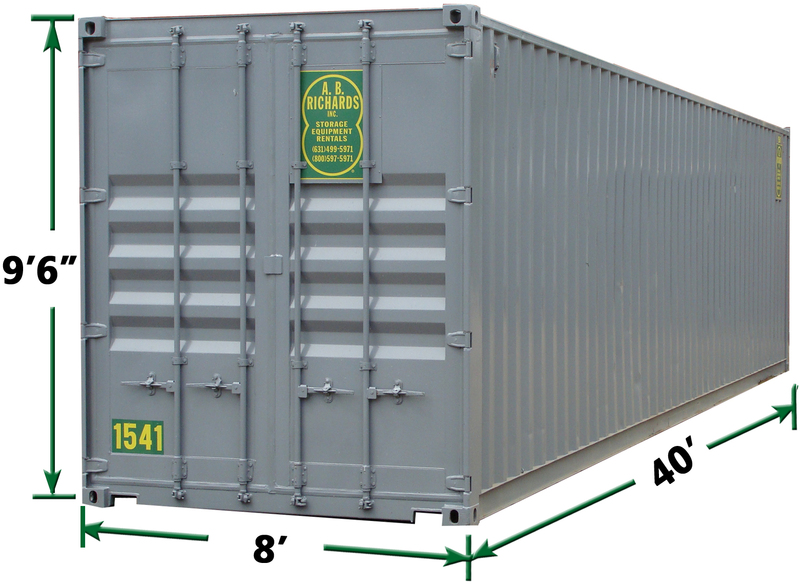 Not sure what size storage container you need? These measurements and dimensions will help. To determine if your heavy machinery will fit in one of our storage containers, look at the lowered or collapsed height for the item. Our 40ft Jumbo Container is more than 9 feet tall, so it will fit a standard-size forklift comfortably. Width is another factor to consider. Most heavy equipment is about 4-7 feet wide, which will fit inside any of our storage container units if the height also fits. Still not sure which storage container you need? Call our customer care experts and they’ll recommend the options that work best for your budget, project, and space. So A.B. Richards saves you time and money, is more convenient and our construction job site storage containers are larger and more cost-effective than other brands. What else do you need? How about great customer service? A.B. Richards in an American company, based in New York, and family owned and operated. Most storage facilities are big corporations based who-knows-where. A.B. Richards has outstanding customer service and a reputation you can trust. 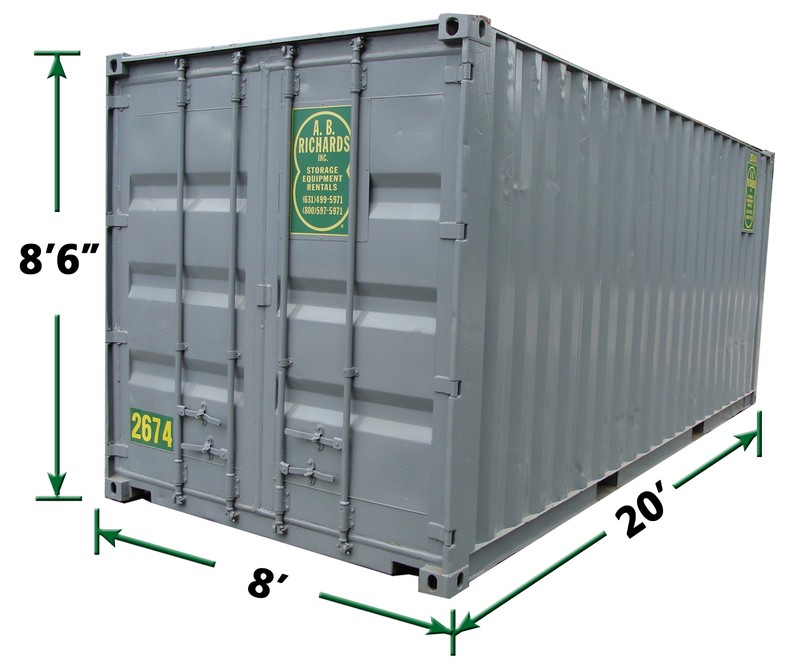 Ready to rent or lease an on-site storage container for your construction project? Call A.B. Richards at (877) 208-8253 or fill out the contact form and a representative will get back to you.